Some cartoons we grow out of, some are timeless and can be loved by adults and children. Then there are some that are really just aimed at kids, but we still love to watch anyway. Are there any cartoons you used to watch when you were younger that you should have grown out of, but for some reason still love them? Are you embarrassed to say that you still watch them? I enjoy a lot of cartoons and am not embarrassed to admit it. My favorite is Scooby Doo- Mystery Incorporated. I'm embarrassed to admit that I still love the Rugrats. 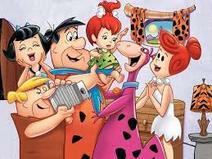 I LOVE THE FLINTSTONES ! I love them too, but I'm not embarrassed about it. I consider it a cartoon for adults and children. My favourite cartoon is The Simpsons, but I'm not embarrassed about it, I love cartoons.